Unlike elections in either the UK or America, there are more than two candidates and parties, so it is not a straightforward contest of strength. Unless there is a candidate with a clear margin, the two parties or candidates polling the most votes then enter a further contest held in May. Currently, there are four main contenders for the Crown: Benoit Hamon for the Socialist Party, Francois Fillon for the Republicans, Marine Le Pen for the National Front and Emmanuel Macron for En Marche. The favourites currently are Le Penn and Macron, so we will look at their chances to win the coveted crown. Marine Le Pen was born on the 5th August 1968 in Paris at 11.20am (Rodden AA Rating). 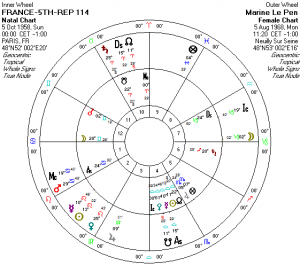 This gives Marine Le Pen Libra rising with her Leo sun, strong in its own sign in the 11th house of Good Fortune. Venus is Lady of the chart and is also in Leo, but visible in the evening sky, so this is a strong Venus. Her Moon is in the 4th sign of Capricorn, properly below the earth. This is a chart with the fire element emphasised. Mercury is also in Leo, but cannot be seen as it is so close to the Sun. Mars is in the last degree of Cancer, very close to the MC degree in the 10th sign. Although Mars is in his Fall, he is participating triplicity ruler and angular. This signifies that while it promises some authority and power neither are something the native gains any enjoyment from and most likely finds tiring, a burden, and something for which they receive criticism, conflict and hate. Jupiter is in the 12th sign of Virgo. As a natural benefic planet in sect, in a mediocre cosmic state and in a bad house it does not impede the ailments or afflictions of the 12th but moderates their duration. The final planet to consider is Saturn. Saturn is in the fiery cardinal sign of Aries that falls on the 7th cusp. Saturn has a partile sextile to Venus. Although Saturn is in fall in Aries, he is very strong, by virtue of being participating triplicity ruler and in his own terms; oriental of and trine the Sun in the 11th from the Sun which is the diurnal ruler of Fire and exalted ruler of Aries; He is both angular and in sect (Hayz). He is however stationary and will go retrograde in two days on the 7th of August. Saturn has exaltation in the Ascendant and rules the 4th and 5th signs. The Moon is in his sign so he is her dispositor. 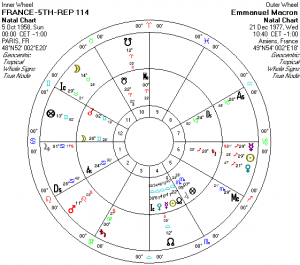 I don’t feel there is need in this short article to further examine her natal chart. But how to see if she has a chance this time round, of winning the French Presidential Election. 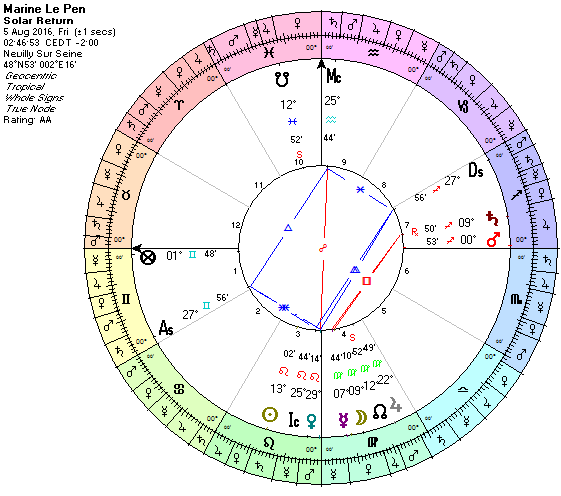 We can compare her birth chart with that of the current French Chart, known as the Fifth Republic. The data for this chart is 5th October 1958 at 00.00 hours Paris. 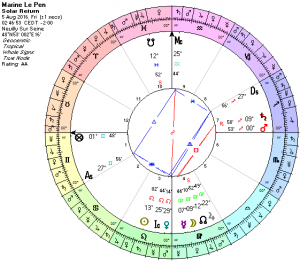 Immediately we see several connections between Marie Le Pen’s chart and this of the 5th Republic. Her Ascendant degree is very close the Sun’s degree of the 5th republic, her South Node is conjunct the Sun of the 5th. Her Mars and MC degree are close to the Ascending degree of the 5th Republic. Her Moon falls in the 7th sign of the 5th Republic and so on. But this doesn’t tell us if she will win the Presidency. Let’s look back to what was going on in her chart at the time of the previous election where she came third. We will look at her Profections and Solar Returns for 2012 and for 2017. In 2012 she was in her 43rd year. That equates to her 8th house. So the planet that was Lord of the year was Venus. 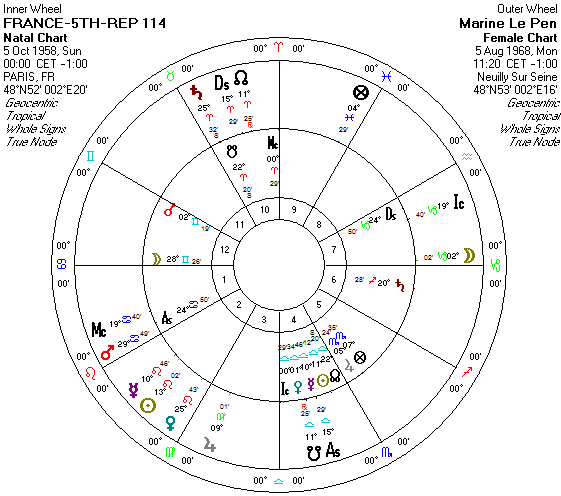 Back to the condition of the natal Venus: It is in the 11th house of good fortune with a very strong dispositor. It is the terms of Mars and the face of Mars. This Venus is peregrine and has very little control over matters connected with the Ascendant or the 8th sign. However, Venus does have a sextile to the Ascendant and a square to the 8th, so can see to manage the affairs of both these houses. Now to her Solar Return that was in effect for the 2012 elections. Here Aquarius rises, so Saturn is LOY. Saturn is in Exaltation, sextile the dignified Sun and Venus, his dispositor. He can also see to manage the affairs of the 1st house. This looks very encouraging. When you look at the houses emphasised with the Profected chart, Taurus is the 4th sign. So the fixed signs will be prominent. The MC degree is conjunct the fixed star Antares. Of this placement, Robson says “Honour, preferment and good fortune. This all looks good, but she didn’t win through to the run off. Let’s look at the profected signs in play during the election. It is in the 9th month or sign from the Ascendant of the profected signs. It is not worth looking at the profected month for May, as she did not reach the run off. The elections were held on the 22nd April 2012. As her profected year started from Taurus; the 22nd April falls in her natal 4th sign of Capricorn. The Moon is here, in detriment but angular, in the earthy triplicity of which she is a ruler. Taking the month from her Solar Return, Taurus was in the 4th house, so the ninth from Taurus was Capricorn. In her Solar Return, Capricorn is the 12th sign. Not an advantageous house. 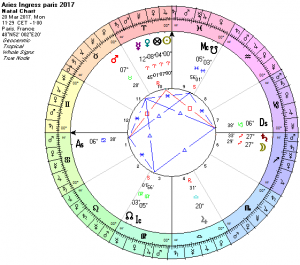 Let’s look at this year’s current Solar Return (2016) and her profected sign. Her Solar Return for 2016 has Gemini rising and she is in her 48th year (Libra profected year so LOY Venus), therefore her natal 9th house is prominent. Analysing her Solar Return chart, Mercury is the ruler, angular, strong in his own sign, in exaltation, in the terms of the greater benefic Jupiter, and the face of Jupiter. However, Jupiter is in his detriement, but under the dispositorship of Mercury. Jupiter is peregrine, being in the terms of Mars and the face of Venus. Mercury applies to Saturn. The triplicity rulers of air signs at night are Saturn, Mercury and Jupiter. Saturn is retrograde but, in an angular sign and has triplicity dignity. He is in the terms of Jupiter and the face of Mercury. He is also conjunct the fixed star Antares. (This echoes the placement of the MC in the 2011 solar return). The Sun and Venus are in the third house. The Sun we know is strong, but what of Venus? She is with her dispositor, free of combustion, and conjunct Regulus. But, she is peregrine being in the terms and face of Mars, so is not very helpful. Let us now assess the degree of her MC in the Solar Return. This falls at 25Aquarius 44, in the terms of Saturn and face of the Moon. This doesn’t have any outstanding features. The two strongest planets in her Solar Return chart for 2016 are the Sun (that’s a given) and Mercury. In Profections, it seems the years when we return to our 1st house (12, 24, 36 etc.) are always extra important. 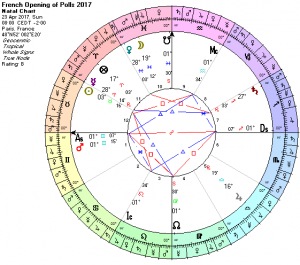 By profecting the months using her natal chart (the sign of Libra), we know the elections are in April, nine months after her birthday. This equates to the sign of Gemini, her 9th sign (and the first house of her current Solar Return chart). Again we have an emphasis on Gemini/Mercury. We have seen Mercury is strong and disposits all planets except Sun and Venus. There is nothing really outstanding to suggest she will win this year. 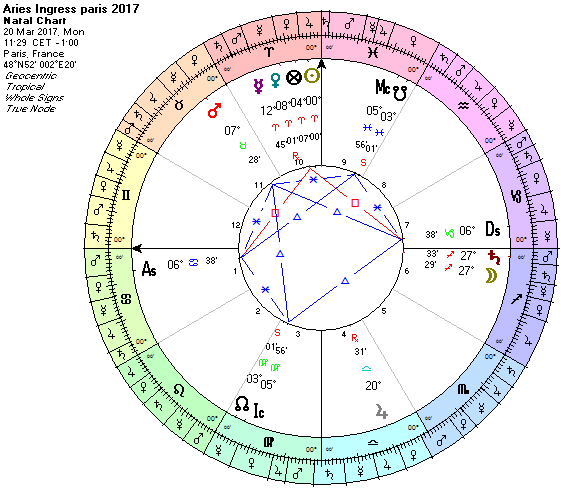 What about the Aries Ingress chart? This chart will have similar Angles for many countries in Europe. As Cancer rises, this chart is only valid for three months. We would need to erect charts for each cardinal ingress of 2017. The Moon is in the 6th sign of Sagittarius, conjunct Saturn. It indicates all the common people are not in a strong position and are bound to all that Saturn can represent. 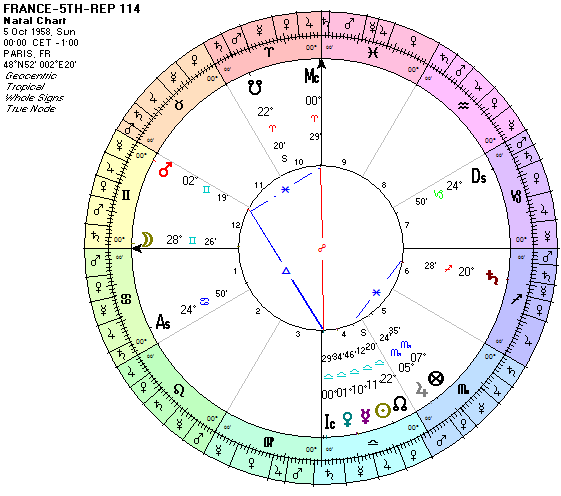 It is just worth checking the angles to see anything echoes her natal and current Solar return chart. 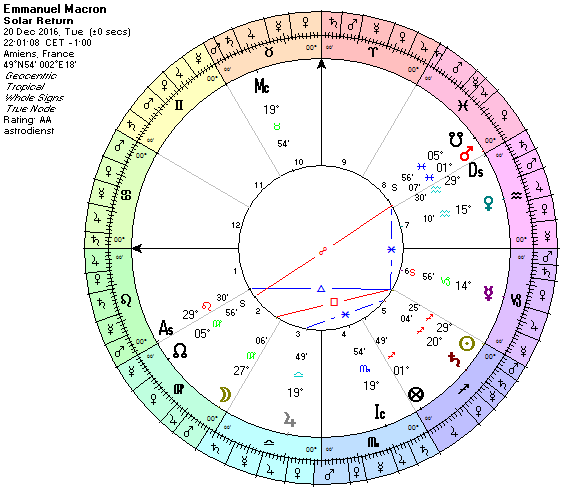 The Paris Ascendant falls in her 10th house, close to opposite her natal Moon. Mercury in the Aries Ingress chart is fairly close to her Descendant degree and Jupiter of the Ingress chart is fairly close to her rising degree. 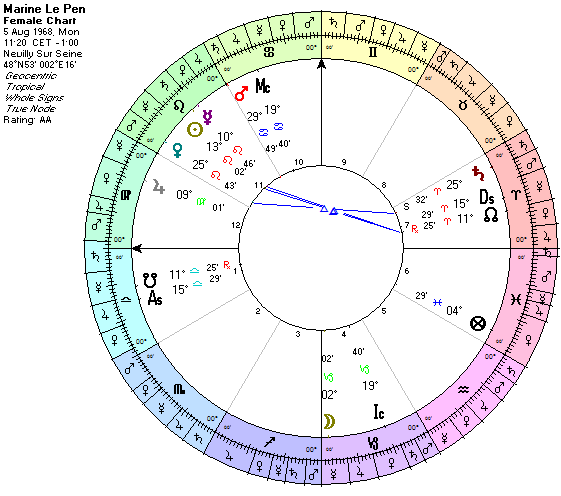 Comparing it to her Solar Return, The Ascendant/Descendant is conjunct her Saturn Moon and her SR Mercury is very close to the IC of the Paris Aries Ingress. Is this enough for her to win? Currently it seems the rival to Le Pen is the relative newcomer, Emmanuel Macron. He was born the 21st December 1977 (age 39), in Amiens France. The time of birth from Astrodienst is AA Rated, 10.40am. His rising sign is 28 Capricorn, Sun at 29 Sag, Moon 14 Taurus, Saturn 0VirgoR and Jupiter 1 Cancer R. His Mars is 11 Leo, Venus is 21 Sag and Mercury 29 Sag R.
His Solar Return for 2016/17 has 29 Leo rising. Naturally this puts the Sun in the 5th in partile trine to the rising degree. 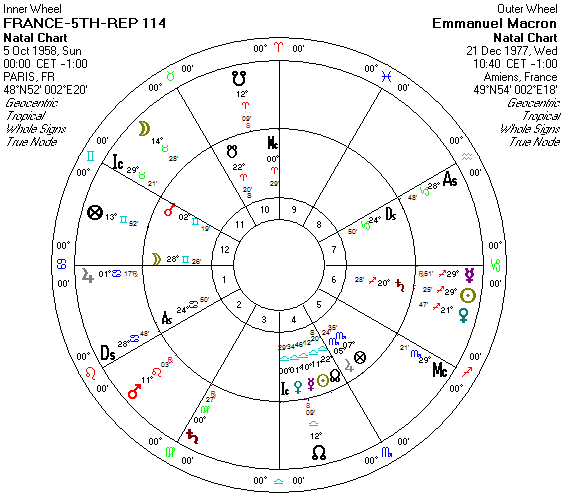 The MC degree (19Taurus) is close to the position of his natal Moon in Taurus. He is in his 4th house profected year of Aries. Mars is LOY. Natally Mars is located in the 8th, retrograde, but with sign aspects to all planets except Jupiter and Saturn who are in aversion to him. Neither can Mars influence the Natal Ascendant. The Profected Ascendant falls in his SR 9th house. Here in the SR, Mars is in aversion to the 9th house, but it does echo by house placement the position of his natal Mars. Natally, the profected Month would be the 8th sign (Leo) taking the start of his profected year from Aries. In his SR chart, the profected sign/house would be Leo/first house. This is a strong testimony that he could do well, as in both cases the Kingly sign is indicated. But, he does have the retrograde, hot headed Mars natally in Leo. He could allow his passion and temper to get the better of him. 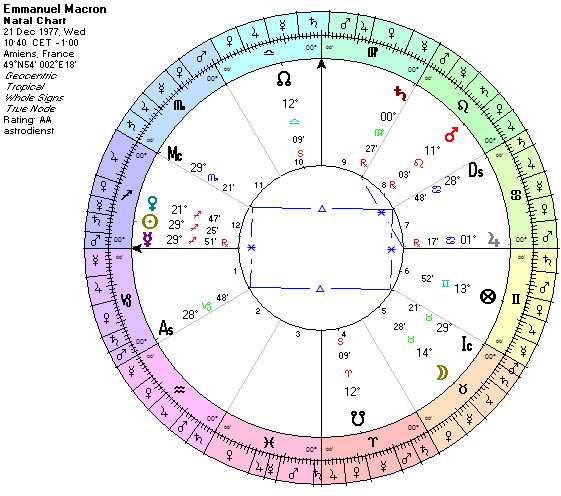 As with Le Pen, let’s check his affiliation to the National Chart and the Aries Ingress. 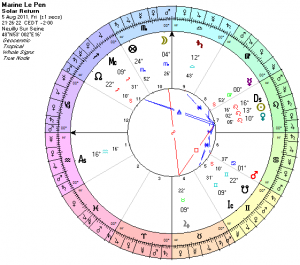 There are not as many connections with the 5th Republic Chart as with Le Pen. He only has Venus conjunct the 5th Rep. Saturn and his Asc/Descendant angles are close to the 24Cancer/Capricorn Asc/Desc of the 5th Rep.
What about the Aries Ingress? (See chart earlier). 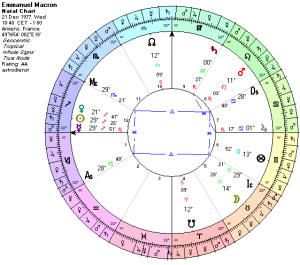 Here there is a little more connection, with Moon and Saturn of the Ingress chart close to his natal Sun and Mercury and the Ascendant of the Aries ingress, close to his Natal Jupiter. 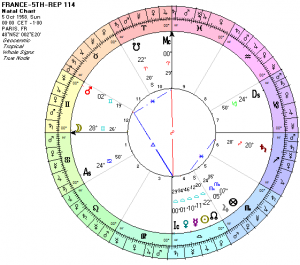 I think the fact this 8th house is in play in his Solar Return and profected chart, suggests he will not win as this the Idle house, and even though it is the sign of Kings, I think with retrograde Mars there natally, it will “spoil” his chances. I think Le Pen will win through default, as much as just having the slightly stronger significators in her various charts. Steven Birchfield looked at the Chart for the Opening of Polls on the 23rd April 2017 and suggested I do the same. It is really hard trying to work out which house/planet should stand for each candidate or party. In fact it is almost impossible to sort out significators for the main four contestants, let alone trying to find planets for the other minority parties. Looking at this chart for the Opening of Polls with Steven, the first thing that strikes one, is the presence of the two feminine planets in the 10th sign. Venus who is oriental of the Sun (that is rises before the Sun), is so strong and prominent in her sign of exaltation and is accompanied by the Moon, significator of the common people and women. Jupiter who could be taken to symbolise the current ruling party owing to his “owning” the 10th sign, is in Libra, a sign ruled by Venus, so there is mutual reception. However, Jupiter is not only retrograde, he is in aversion or turned away from the 10th house. He cannot see to manage the affairs of the 10th house or Magistery. The fact that both feminine planets are in the 10th and in various levels of dignity, suggests a woman will triumph.